Watch the video at the end of the photos that displays all aspects of this beautiful cottage and it's surroundings. This adorable sea side cottage located on the pebble beach of SW Harbor is literally over hanging the water at high tide. 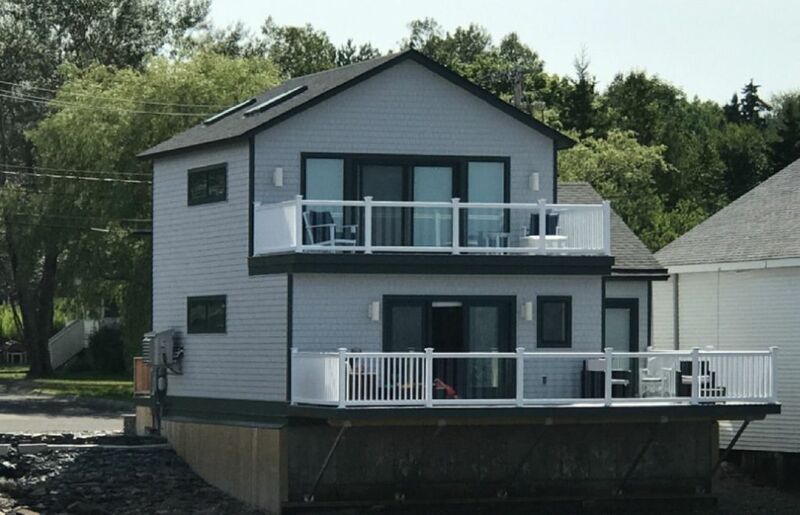 A second floor master king suite with private balcony, bath, wet bar and refrigerator has a magnificent view of the harbor and mountains of Acadia National Park. The second bedroom is a queen suite with private entrance to the first floor balcony. Just 2 miles to Seawall Beach of Acadia, an easy bike ride or walk for many. Some may not leave the cottage at all and just watch the boating activity from the large relaxing decks. If you do explore the island, you'll find many beautiful hikes, shops, restaurants, golf, museums, cinemas and more . Natives to the island, we have owned rental properties for over 40 years. Many guests return every year. We also own a real estate company and an electrical contracting business. We enjoy Yachting the Maine coast, biking the island and walking the trails when time allows. If you want to experience living on the working harbor of a Maine village and visit the beauty of Acadia National Park, this cottage is for you. The view from Seashore Cottage is one of the most dramatic on Mount Desert Island and the entire Maine coast. Kitchen, dining and living room are one great room overlooking the harbor. The house is new but has old charm. The view is amazing. We were entertained by the Hinckley boat yard hauling boats and the ducks who came and went during the day. This place is perfect! We were cozy warm and found everything we needed stocked. Will definitely come back. The home is beautiful. However there were 2 issues. Both TV's were hard to figure out how to get them on and how to change channels. It shouldn't be set up to be so difficult. The towels upstairs were sour smelling; like when they are left sitting too long in the washer and they start to sell like mildew. That's all I got. A Paradise... Beautiful Place with everything !!!! We loved staying in this home away from home and were delighted to see it was right next to Hinckley! Within minutes of our favorites: Beal's Lobster Pier, Quietside Cafe, Sawyer's and more. Peaceful and quiet with breathtaking sunsets. Everything is modern and new, with plenty of space for everything and everyone. We opted to stay in for a few meals and simply enjoy the place--you will too. We plan to return at the very next opportunity. Fabulous, well-appointed, and elegant house with a constantly changing and entertaining view. Spent the cold dreary week working on our yawl steps away in the Hinckley Yard. The house is literally hanging over the sea wall, the view east is spectacular. Comfortable, every modern amenity, just perfect for a two couples.